Do you know these places? Would a place that has cliffs like these merit being declared a national park? Thankfully, these rocky precipices are in a national park already. But these are not the iconic features that end up in the photo collections of the millions of tourists that visit this place every year. But these cliffs contribute to the awesome scenery by serving as the backdrop for some very famous rocks. They serve as the supporting chorus behind the hardrock band, so to speak. They are the unsung cliffs of Yosemite Valley (the Ah-wah-nee). As far as I know, few of these escarpments have a mythical legend that celebrates their existence. If these cliffs of Yosemite Valley could talk, they would have something to say about my recent little miniseries on the most famous rocks that can be seen from the valley floor. They would say "but, none of these cliffs could be famous without the un-famous cliffs and slopes that lay between". The first picture in this post has a waterfall that is usually dry by the time most tourists begin arriving in June or July. When it is running it is often mistaken for Yosemite Falls by first-time visitors (until they see Yosemite Falls anyway). 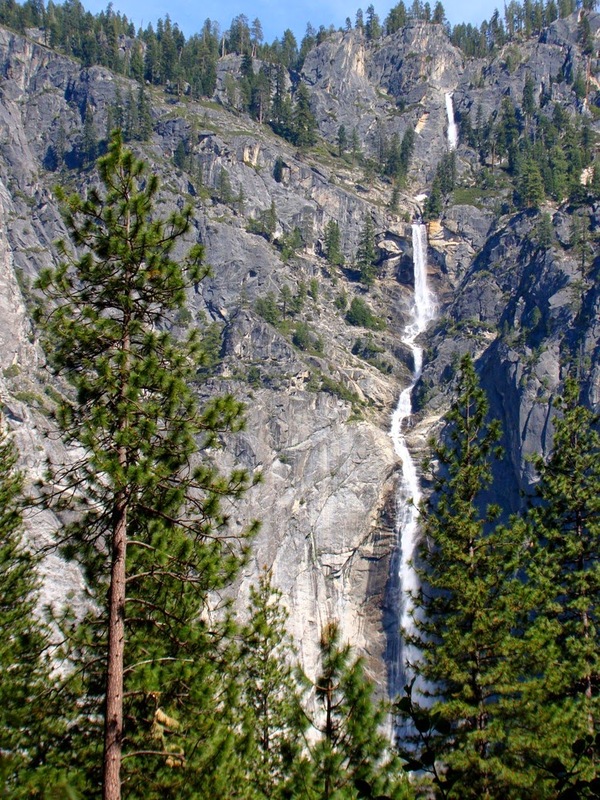 It is Ribbon Falls, which is actually the waterfall at Yosemite with the greatest unbroken drop (1,612 feet; 491 meters). Compare that to Upper Yosemite Falls at 1,430 feet (436 meters). 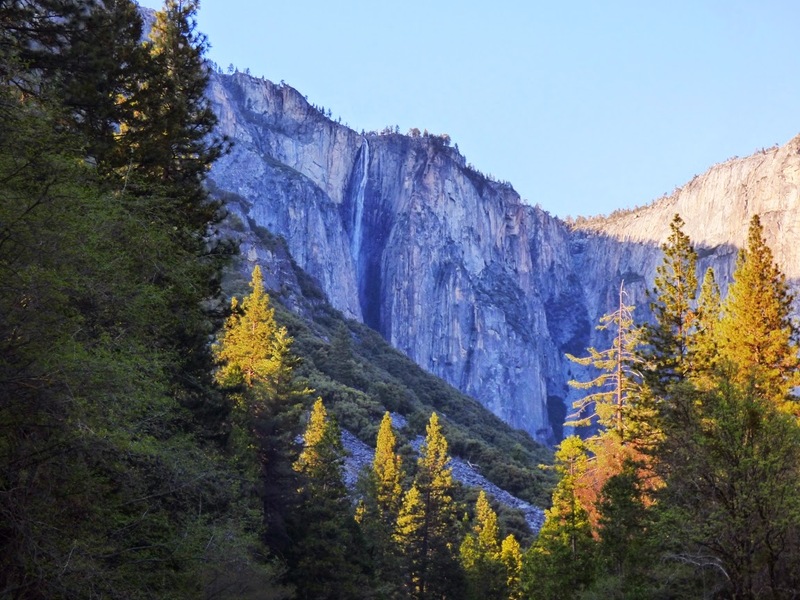 The total drop of the three steps of Yosemite Falls totals 2,425 feet (735 meters), making the better-known fall one of the top ten highest falls in the world. Ribbon is apparently 99th. But imagine if it were the only fall at Yosemite. How famous it would be! It doesn't always get noticed because it lies just west of the boldest cliff of El Capitan. The cliff in the picture above is an unnamed spire in the vicinity of Sentinel Rock. Although the cliff is thousands of feet tall, it is less imposing than Sentinel because it is more highly jointed (fractured). The rocks have been darkened by lichens and staining and thus appear darker than most of the granite cliffs (fresh exposures from more recent rockfalls reveal the lighter rock). The partly rounded rock on the left in the picture above is the familiar Leaning Tower, although the lean is not so prominent from this angle. The rugged cliffs on the right include Dewey, Crocker, and Stanford Points, but the cliffs have no particular name. Like the previous photo, the rocks are more highly jointed, resulting in a recessed cliff face with talus (slopes of fallen boulders) covering the lower portions. To me, one of the most striking features of Yosemite Valley is the total non-cliff that lies just west of Ribbon Falls and El Capitan. Instead of a vertical precipice, the slope is almost entirely buried in talus from the constant collapse of what cliffs there are. The dark-colored plutonic rock is called, not too surprisingly, the Diorite of the Rockslides. 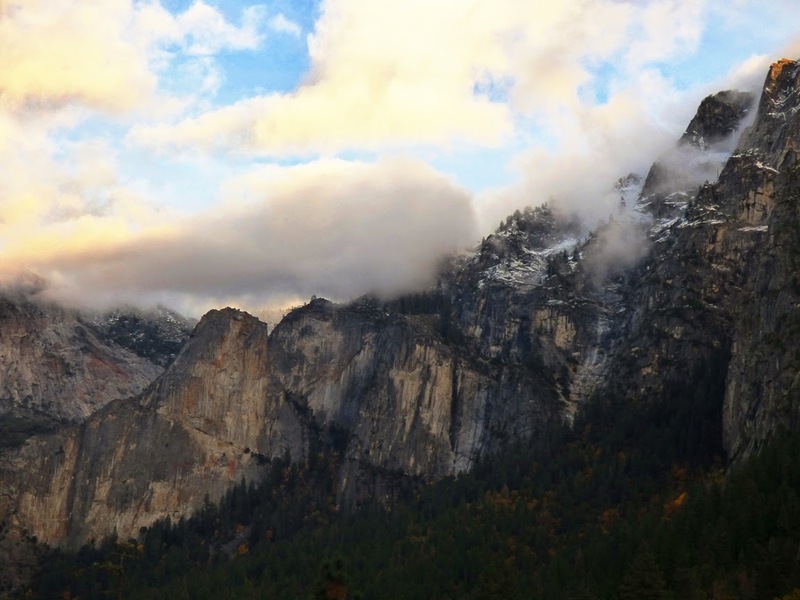 It is the most highly jointed of all the rocks in Yosemite Valley. 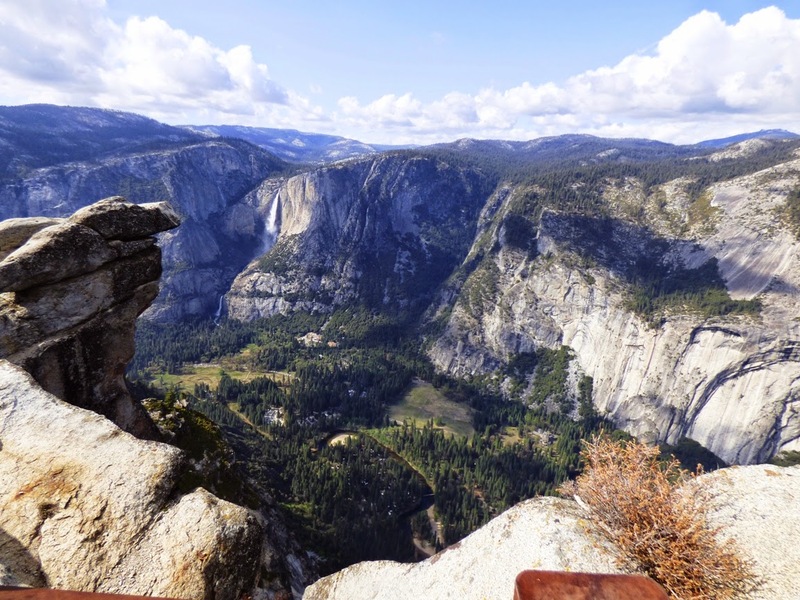 The next picture is a familiar view to anyone who has visited Glacier Point. Yosemite Falls is apparent on the left, and the Royal Arches are partly visible on the right, but the cliffs in-between are less familiar, in part because of the intense jointing that has led to a less bold appearance. The deep cleft in the center of the photo is Indian Creek, and the crenelated cliffs to the left of the creek are called the Castle Cliffs. 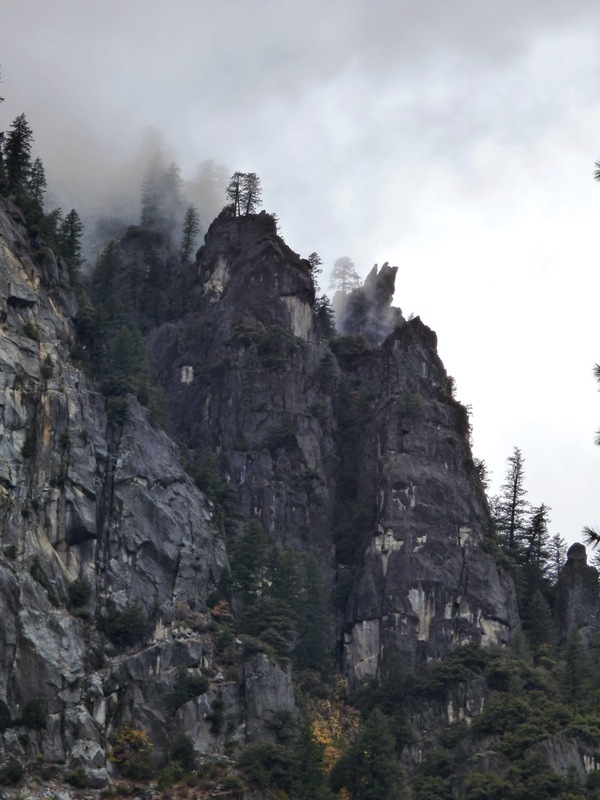 Panorama Cliff appears in many photographs taken from the vicinity of the Ahwahnee Hotel, but few know the name. 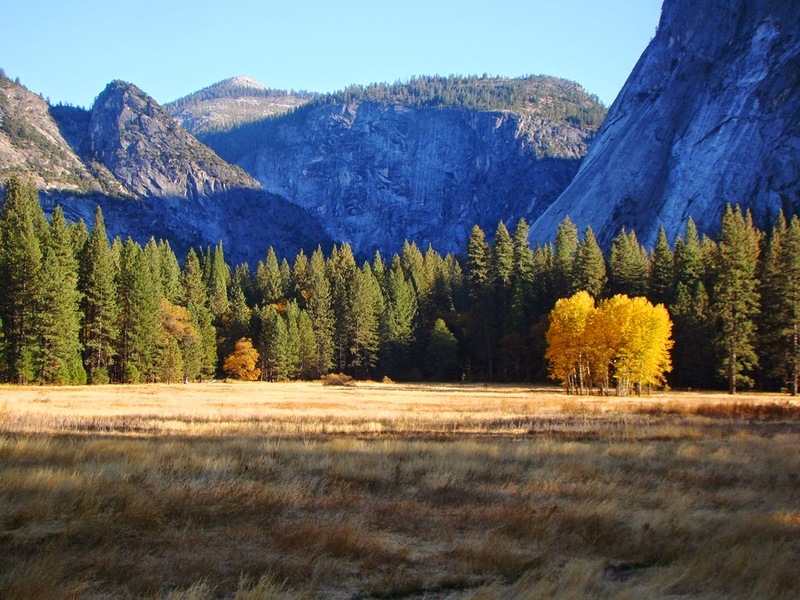 It forms the south wall of the Merced River canyon where it emerges from Little Yosemite Valley. One would think that waterfalls thousands of feet high would get more attention, but these two are very seasonal, generally drying up by late May or early June. 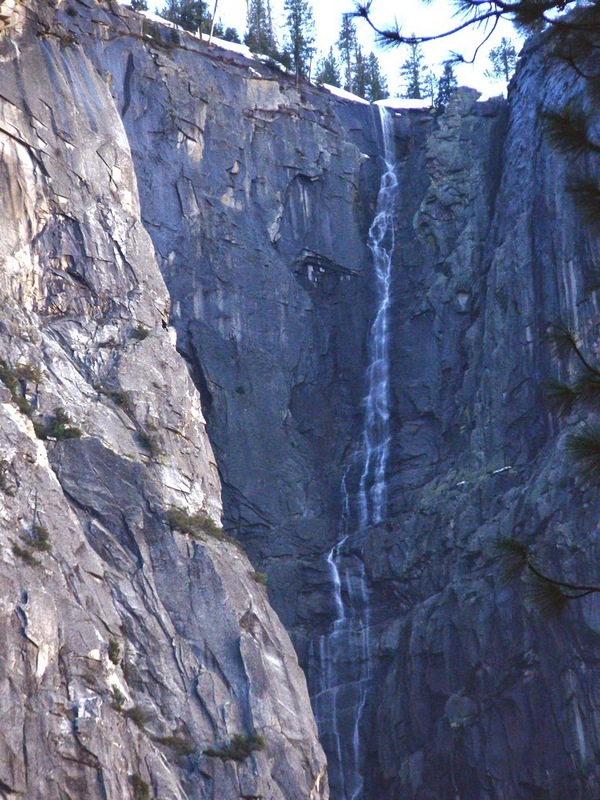 The one above is the Widow's Tears, a 1,170 foot high waterfall tucked into the cliffs near Crocker and Stanford Points west of Leaning Tower. It has been mistaken for and mislabeled as Silver Strand Fall, which is much shorter. And finally, there is Sentinel Falls, a 1,920 ft (590 m) fall on the west flank of Sentinel Rock. Like the other less famous waterfalls, it is ephemeral, and often dry by early summer. The biggest drop among the many cascades is about 500 feet high. Light and shadow. Positive and negative.Yin and yang. Mrs. Geotripper, the artist, tells me that yin and yang can be thought of as complementary (rather than opposing) forces that interact to form a dynamic system in which the whole is greater than the assembled parts. That is what these cliffs accomplish at Yosemite Valley. For every bold cliff like El Capitan, Half Dome, or Sentinel Rock, there are recessed cliffs that lie in the shadows. Hidden among these recessed cliffs are beautiful waterfalls that during the right time of year rank as some of the world's highest and most dramatic. 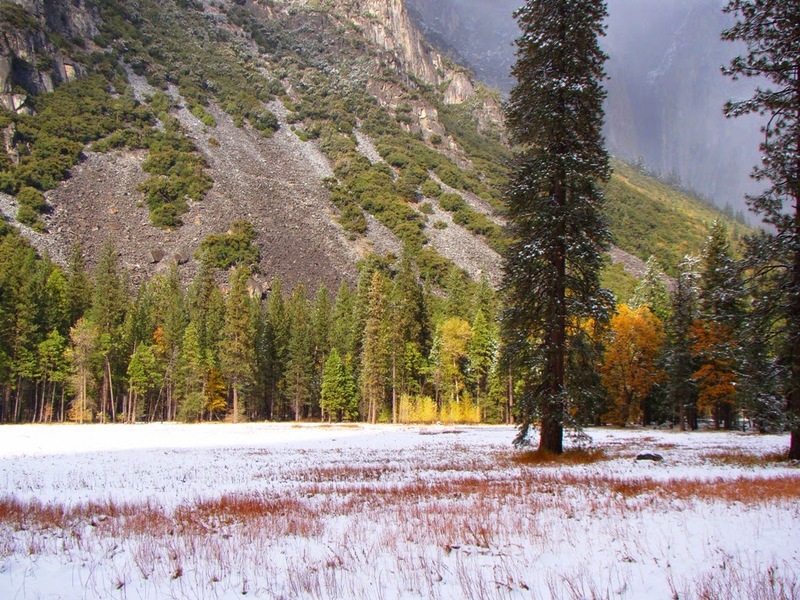 If we could just find them among the richness of features at Yosemite Valley!